Earlier this year, a new café opened up in Victoria. 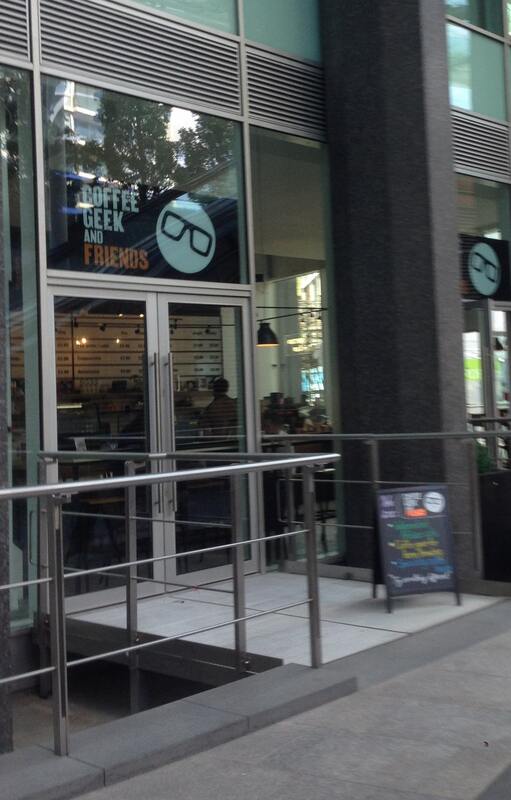 Coffee Geek and Friends is located at the far end of Cardinal Place as you enter from Victoria Street. Cardinal Place is an odd sort of shopping centre, a small collection of shops with a glass roof. The building site near Coffee Geek as well as the constant stream of people rushing to and fro make Coffee Geek an ideal place to spend some time watching the world go by. Coffee is by Allpress espresso and is served in very individual mugs. Apparently there is a range of geek-ery in the cafe including a ‘centre piece’ water filter but I admit I missed that as I was too focussed on my coffee. Coffee Geek and Friends is definitely a cafe to keep in mind (along with Irish & June’s) if you need a good place to meet near Victoria Station. 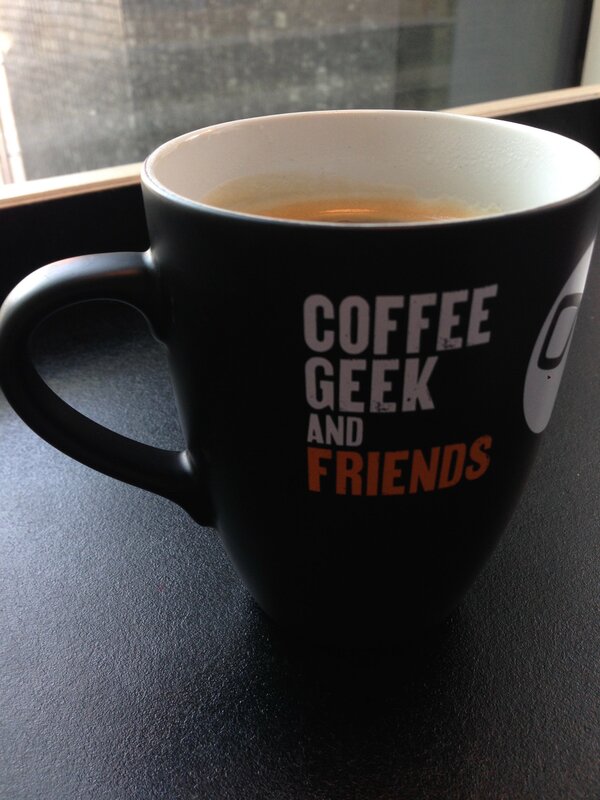 It was a very humid day when I enjoyed my coffee at Coffee Geek and, because the mug had not been pre-warmed before my Americano/long black (my notes don’t specify which) was poured into it, condensation quickly formed around the rim of the mug. The condensation forms for the same reason that dew forms after a cool night: the vapour pressure of the water above the coffee (or the ground) has reached the dew point at the temperature of the mug. The lower the temperature, the lower the vapour pressure has to be for the water in the atmosphere to start condensing into liquid droplets. Hence you will often find that your coffee is more ‘steamy’ on a winter’s, rather than a summer’s day. Just over two hundred years ago, William Charles Wells made a study of dew. He observed the weather conditions under which dew formed. He observed on which surfaces dew collected. He noted whether the dew formed on space facing surfaces or ground facing surfaces. After several years of careful study he published his “Essay on Dew” in 1814. His work, showed that the earth radiated heat at night (when it was not being kept warm by the Sun) and therefore that space was cold. Cloud cover reduced the amount by which the ground cooled which implied that cloud cover was acting as a type of blanket for the Earth, keeping the heat trapped inside. Later calculations of the balance between the heat radiated by the Earth and the heat received by the Sun confirmed that, without some heat getting trapped by clouds and ‘greenhouse’ gases in the atmosphere, the earth would be a good 30 C cooler than it is observed to be. Although these calculations are just rough, “back of the envelope” figures, detailed calculations confirm that the Earth is in a delicate balance, heated by the Sun, cooled by radiation and kept warm (and live-able) by a layer of natural greenhouse gases. This “natural greenhouse effect” has been necessary for our development, the problem is that now we are adding yet more greenhouse gases to the atmosphere which threatens to tip the established delicate balance by a few degrees. What we now call the greenhouse effect are these extra gases, which are more efficient at trapping heat within our atmosphere. If you can imagine what has been happening over the past three hundred years or so as we have been pumping yet more of these gases into the atmosphere at an accelerated rate, we are in danger of tipping this delicate balance towards further heating of the earth. The 2015 Paris Climate Conference is being held with the aim of requiring all nations to agree to a legally binding commitment to reduce the amount of extra greenhouse gases that we emit to a level that will only result in a temperature increase of 2C. To achieve this requires all of us to work together to reduce our own ‘carbon footprint’. Each of us will have to find our own, individual ways to reduce our emissions but perhaps when we look at the condensation on the rim of our coffee cup, we could remember William Charles Wells and his essay on dew and just think, what can I do, at this moment, to reduce my carbon footprint? Maybe it could be something as simple as turning off that phone (to conserve the battery) and watching what is going on in a café instead. A small gesture but one that would be good for us as well as the earth. 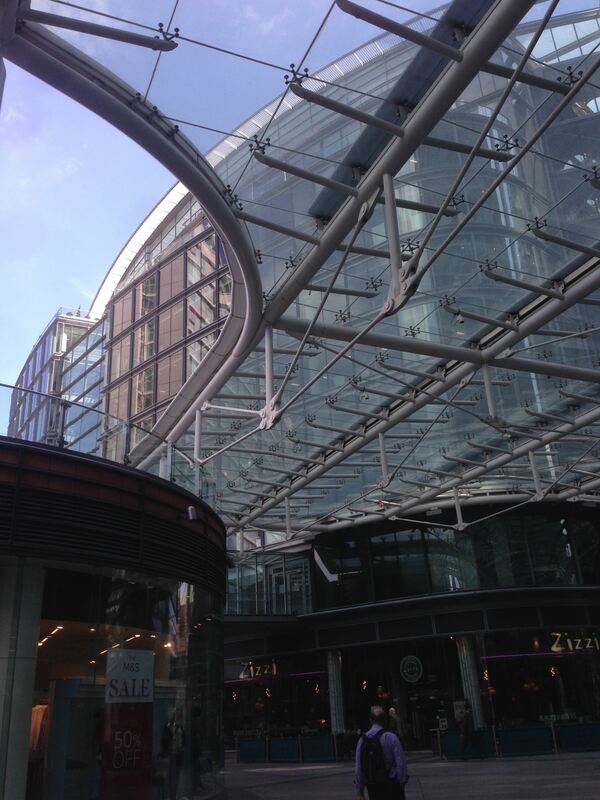 Coffee Geek and Friends is at the northern end of Cardinal Place shopping centre (opposite Westminster Cathedral). As a Coffee Geek note, I would like to just comment that my notes on Coffee Geek and Friends were written using a “linux-sure” ball point pen. Not particularly environmentally friendly but definitely quite geeky.